Indian Coast Guard Navik 2015 notification has released on its official website www.joinindiancoastguard.gov.in . 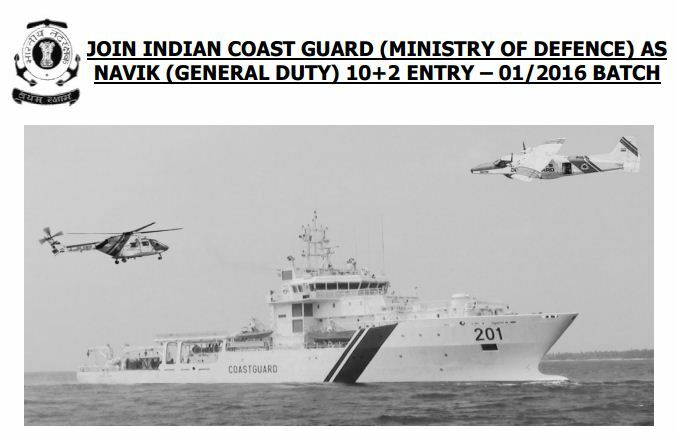 Indian Coast Guard recruitment for the post of Navik (General Duty) 10+2 Entry-01/2016 Batch in the Indian Coast Guard, an Armed Force of the Union. The Indian, male and unmarried fellows are invited to apply for the vacancy. The other information about the Indian Coast Guard Recruitment is elaborated further below. Educational Qualification: 10+2 passed with 50 marks aggregate in total and minimum 50% in each subject of Maths and Physics form an education board recognized by Central/ State Government. Age Limit: Minimum 18 years and maximum 22 years. How to apply: Eligible candidates can apply online form 06 July to 13 July 2015.Candidates are to logon to www.joinindiancoastguard.gov.in and click on opportunities button.